Of the national radio stations, BBC Radio 1, 2, 3, 4 and 5 Live are all available through analogue radio (5 Live on AM only) as well as on DAB Digital Radio and internet services through RealMedia, WMA and BBC iPlayer. The remaining stations, BBC Radio 1Xtra, 4 Extra, 5 Live Sports Extra and 6 Music, all broadcast on digital platforms only. Although no other broadcasting organisation was licensed in the UK until 1973, commercial competition soon opened up from overseas. The English language service of Radio Luxembourg began in 1933 as one of the earliest commercial radio stations broadcasting to Britain and Ireland. With no possibility of commercial broadcasting available from inside the UK, a former British Royal Air Force captain and entrepreneur (and from 1935 Conservative Party member of parliament) named Leonard F. Plugge set up his own International Broadcasting Company in 1931. The IBC began leasing time on transmitters in continental Europe and then reselling it as sponsored English-language programming aimed at audiences in Britain and Ireland. Because Plugge successfully demonstrated that State monopolies such as that of the BBC could be broken, other parties became attracted to the idea of creating a new commercial radio station specifically for this purpose. It was an important forerunner of pirate radio and modern commercial radio in the United Kingdom. The onset of World War II silenced all but one of the original IBC stations, only Radio Luxembourg continued its nightly transmissions to Britain. Beginning in 1964 the first in what became a fleet of 10 offshore pirate radio stations began to ring the British coastline. By 1967 millions were tuning into these commercial operations and the BBC was rapidly losing its radio listening audience. The British government reacted by passing the Marine Offences Act, which all but wiped out all of the stations by midnight on 14 August 1967. Only Radio Caroline survives. The BBC hired many out-of-work broadcasting staff who had come from the former offshore stations. Tony Blackburn who presented the very first BBC Radio One morning show had previously presented the same morning show on Radio Caroline and later on Big L. He attempted to duplicate the same sound for BBC Radio One. Among the other DJs hired was the late John Peel who had presented the overnight show on "Big L", called The Perfumed Garden. Though it only ran for a few months prior to Big L's closure, The Perfumed Garden got more fan mail than the rest of the pop DJ's on Radio London put together, so much that staff wondered what to do with it all. The reason it got so much mail was that it played different music, and was the beginning of the "album rock" genre. Big L's PAMS jingles were commissioned to be resung in Dallas, Texas so that "Wonderful Radio London" became "Wonderful Radio One on BBC". The BBC Light Programme (1945–67) was renamed Radio 2 and broadcast easy listening, folk, jazz and light entertainment. The evening BBC Third Programme (1946-???) and daytime BBC Music Programme (1965-) were merged under the heading of Radio 3, although the Third Programme kept its separate title until 1970. 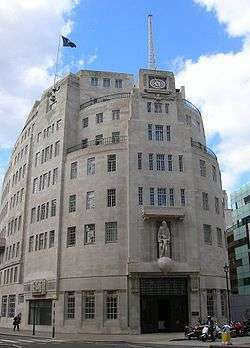 The BBC Home Service (1939–67) became Radio 4. With the increased rollout of Digital Audio Broadcasting (DAB) between 1995 and 2002, BBC Radio launched several new digital-only stations BBC 1Xtra, BBC 6 Music and BBC 7 in 2002 on 16 August, 11 March and 15 December respectively — the first for "new black British music", the second as a source of performance-based "alternative" music, the latter specialising in archive classic comedy shows, drama and children's programmes. BBC Asian Network joined the national DAB network on 28 October 2002. The stations have since been renamed to include the BBC Radio brand, to BBC Radio 1Xtra, BBC Radio 6 Music, and BBC Radio 7. In 2011, BBC Radio 7 was renamed BBC Radio 4 Extra as the service was brought more into line with BBC Radio 4. The BBC today runs eleven national domestic radio stations, six of which are only available in a digital format: via DAB Digital Radio, UK digital television (satellite, cable and Freeview) plus live streams and listen again on the Internet. BBC Radio 1: youth oriented, mostly contemporary pop and rock music (including Top 40 singles), plus news, original in-house live music sessions, original live music concerts and music documentaries. Available on 97-99 FM in addition to digital platforms. BBC Radio 2: adult oriented entertainment, wide range of music—specially adult contemporary and middle of the road, also talk, comedy, plus news, original in-house live music sessions, original live music concerts and music documentaries. Available on 88-91 FM and on digital platforms. BBC Radio 3: arts and high culture, special-interest music (classical, jazz, world music), plus news, original in-house live music sessions, original live music concerts and music documentaries. Available on 90-93 FM and digital platforms. BBC Radio 4: news, current affairs, arts, history, original in-house drama, original in-house first-run comedy, science, books and religion. The service closes down and simulcasts the BBC World Service from 01:00 to 05:20 daily. Available between 92-95 and 103-105 FM, 198 LW, various medium wave frequencies and on digital platforms. BBC Radio 5 Live: news, sports and talk programmes available on 909/693 MW and digital frequencies. The BBC also runs radio stations for the three "national regions". These stations focus on local issues to a greater extent than their UK counterparts, organising live phone-in debates about these issues, as well as lighter talk shows with music from different decades of the 20th century. 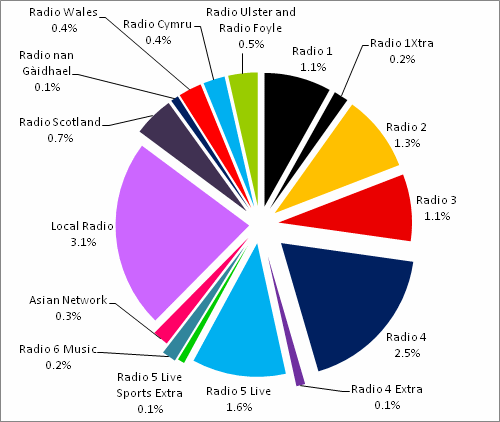 Compared to many advertising-funded Independent Local Radio (ILR) stations, which often broadcast contemporary popular music, BBC nations' radio stations offer a more "serious" alternative. They are also available on Digital Television sets in the UK, and archived programs are available for 7 days after broadcast on the BBC website; a number of trials of MP3 downloads and podcasting for selected shows are also under way—see BBC Online#Streaming media. The BBC also syndicates radio and podcast content to radio stations and other broadcasting services around the globe, through its BBC Radio International business which is part of BBC Worldwide. Programmes regularly syndicated by BBC Radio International include: In Concert (live rock music recordings from BBC Radio 1 and BBC Radio 2, including an archive dating back to 1971); interviews, live sessions and music shows; Classical Music (including performances from The BBC Proms); Spoken Word (Music documentaries, Dramas, Readings, Features and Comedies, mainly from BBC Radio 4) and channels, including BBC Radio 1. BBC Radio International also provides many services internationally including inflight entertainment, subscription, and satellite services. BBC Radio International is partnered with (Sirius Satellite Radio) and (British Airways) as well as many other local radio stations. Sports Report (1948–present): Saturday sports round-up including the football results of the day. Top Gear / John Peel (1967–2004): Pioneering and influential alternative music programme. The official title of this post has changed over the years. The most recent was in 2006 when it became "Director of Audio and Music" to reflect the BBC's online audio services. ↑ "BBC Management Structure". 26 July 2013. BBC. Retrieved 26 July 2013. ↑ "The Offshore Radio Revolution in Britain 1964–2004". H2G2. 31 August 2004. Retrieved 22 July 2007. ↑ Imogen Carter (27 September 2007). "The day we woke up to pop music on Radio 1". Daily Telegraph. Retrieved 30 September 2007. 1 2 Andrews, Amanda (28 Nov 2010). "BBC enlists commercial sector help to shake up radio". The Telegraph. Retrieved 12 March 2011. ↑ "World s largest international broadcaster visits city". Coal Valley News. Archived from the original on 21 January 2011. Retrieved 16 February 2011. ↑ "BBC Full Financial Statements 2012/13" (PDF). BBC Annual Report and Accounts 2012/13. BBC. 2013. pp. 8–9. Retrieved 17 August 2013.